탈린, 에스토니아의 도렐 호텔 | 호스텔월드에서 예약하세요. Dorell Hotel offers 30 rooms of different categories. Dorell is situated in central part of Tallinn, near famous sights like Old Town, Kadriorg Palace, a monument to 'Mermaid' and others. Nearby are shopping centers, banks and many restaurants. The historic part of the city about 1 km to get to it is not difficult: on foot it takes only 10-15 minutes of walk. If you use public transportation you need to drive 1-2 stops (tram or bus). Also nearby (700m) is the passenger port. 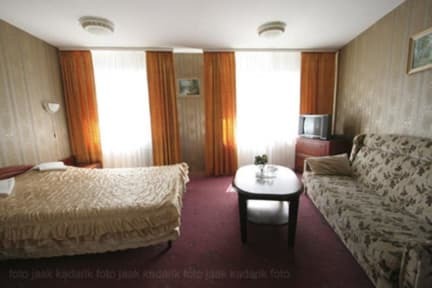 Services: 24-Hour Front Desk, meeting room / conference / banquet hall, service 'wake me up', a separate room for smoking, sauna (at extra cost). Iron/ironing board and hairdryer are available on request from reception. Safety deposit boxes are available at reception (at extra cost). We also offer free short-term luggage storage. Parking: We have free parking in guesthouse yard, (If there is availability) but it is not secured. You have also an opportunity to leave your car at safe private parking (3 EUR/per day), that is located 5 minutes from Dorell. Breakfast: Buffet breakfast is served every morning 8.00 to 10.00 am.